The monarch butterflies of Archie's Garden are strange, beautiful creatures. Especially in Spring Time, the garden is filled with flowers and butterflies. It seems a magical place. Unfortunately, though, nature is not only beautiful, but has a harsh side to it. In the past, we've talked about some scary things. Today, we are going to talk about another scary thing: a parasite called Ophryocystis elektroscirrha, or "OE" for short. In Archie's Garden, we sometimes see butterflies that have trouble eclosing, or trouble unfolding their wings after they eclose. If the butterflies don't straighten out their wings, the wings will remain all wrinkled and the butterfly won't be able to fly. If they can't fly, they won't survive very long. We call these guys "crumpies" because of their crumpled wings. Picture of a "crumpy" - click to enlarge. When we first saw this, it seemed to happen more during colder weather, and we assumed that it was because of the cooler temperature. 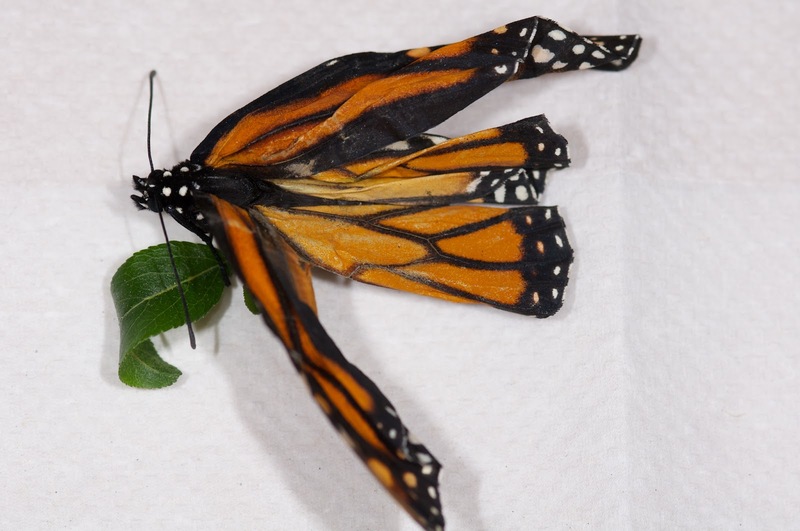 As we have learned more about monarch butterflies, we now believe it's because of infection with OE. To find out whether the butterflies were infected with OE, we pushed clear tape against the bodies of crumpies who had not survived. The tape is sticky, and pulls off loose butterfly feathers and debris. 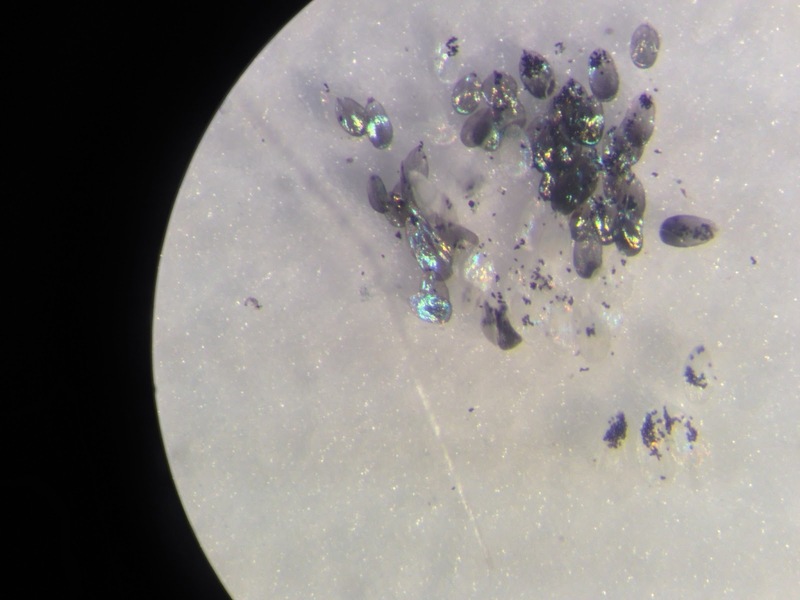 We then took that tape, and looked at it under a microscope at about 50x magnification. The big, roundish things in the pictures are individual feathers from the monarch. 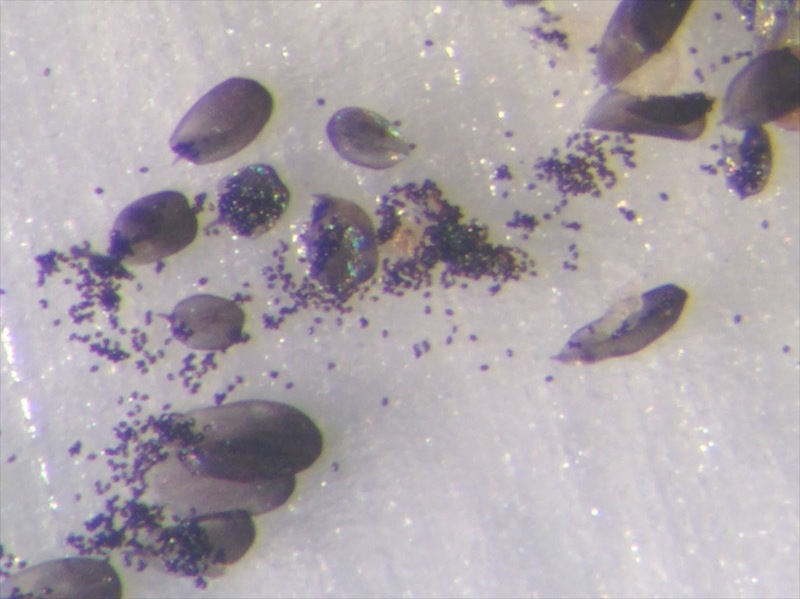 The little sand-like grains, however, are OE spores. What we saw confirmed what we were afraid of. The crumpies are suffering from OE infection. We don't know exactly what to do. The crumpies usually would not survive the night after they eclosed, so used to put them out on the milkweed so they could feed at the flowers. We now know this was a bad idea, since that only spreads more of the dangerous spores. We will try to keep them isolated from the plants in the future. 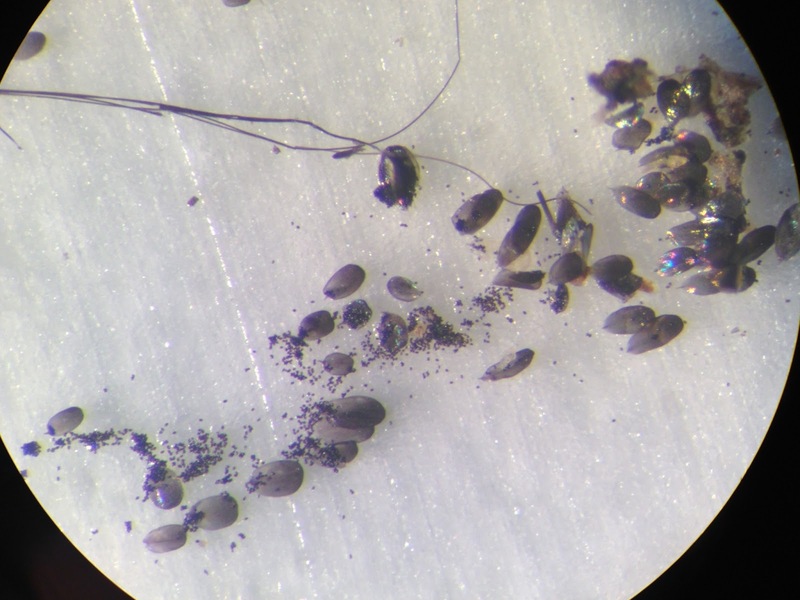 We have read about techniques for sterilizing milkweed plants using bleach spray, and other people talk about cutting the plants down in the winter and disposing of the older growth. Because the infection is in the monarch population at large, this might reduce the problem but it won't solve it entirely. We have plenty of healthy butterflies growing up too, so we're not sure how bad the situation is. We will keep watching and learning, and we will report what we learn here. So bad to hear about the poor butterflies. Butterflies are the most beautiful creature of God and the garden of flowers looks incomplete without them. We had seven enclose today today, one with all 4 wings reversed. Has this been seen before. We have released over 60 since January. It has been hot here in the last two days (95°F) here in Southern California.